Büchler, D., Calandra, R., Peters, J. High-speed and high-acceleration movements are inherently hard to control. 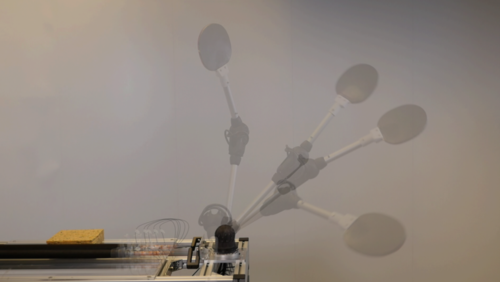 Applying learning to the control of such motions on anthropomorphic robot arms can improve the accuracy of the control but might damage the system. The inherent exploration of learning approaches can lead to instabilities and the robot reaching joint limits at high speeds. Having hardware that enables safe exploration of high-speed and high-acceleration movements is therefore desirable. To address this issue, we propose to use robots actuated by Pneumatic Artificial Muscles (PAMs). In this paper, we present a four degrees of freedom (DoFs) robot arm that reaches high joint angle accelerations of up to 28000 °/s^2 while avoiding dangerous joint limits thanks to the antagonistic actuation and limits on the air pressure ranges. With this robot arm, we are able to tune control parameters using Bayesian optimization directly on the hardware without additional safety considerations. The achieved tracking performance on a fast trajectory exceeds previous results on comparable PAM-driven robots. We also show that our system can be controlled well on slow trajectories with PID controllers due to careful construction considerations such as minimal bending of cables, lightweight kinematics and minimal contact between PAMs and PAMs with the links. Finally, we propose a novel technique to control the the co-contraction of antagonistic muscle pairs. Experimental results illustrate that choosing the optimal co-contraction level is vital to reach better tracking performance. Through the use of PAM-driven robots and learning, we do a small step towards the future development of robots capable of more human-like motions. Kapoor, V., Besserve, M., Logothetis, N. K., Panagiotaropoulos, T. I.
Ruiz, F. J. R., Valera, I., Svensson, L., Perez-Cruz, F.
Ewerton, M., Rother, D., Weimar, J., Kollegger, G., Wiemeyer, J., Peters, J., Maeda, G.
Manschitz, S., Gienger, M., Kober, J., Peters, J.
Paraschos, A., Rueckert, E., Peters, J., Neumann, G.
Osa, T., Pajarinen, J., Neumann, G., Bagnell, J., Abbeel, P., Peters, J.
Paraschos, A., Daniel, C., Peters, J., Neumann, G.
Kroemer, O., Leischnig, S., Luettgen, S., Peters, J.
Vinogradska, J., Bischoff, B., Peters, J.
Yi, Z., Zhang, Y., Peters, J.
Fioravanti*, D., Giarratano*, Y., Maggio*, V., Agostinelli, C., Chierici, M., Jurman, G., Furlanello, C.
Leehr, E. J., Schag, K., Dresler, T., Grosse-Wentrup, M., Hautzinger, M., Fallgatter, A. J., Zipfel, S., Giel, K. E., Ehlis, A.
Disselhorst, J. A., Krueger, M. A., Ud-Dean, S. M. M., Bezrukov, I., Jarboui, M. A., Trautwein, C., Traube, A., Spindler, C., Cotton, J. M., Leibfritz, D., Pichler, B. J.
Ramirez-Villegas, J. F., Willeke, K. F., Logothetis, N. K., Besserve, M.
Vergari, A., Di Mauro, N., Esposito, F.
Veiga, F. F., Edin, B. B., Peters, J. Living organisms from single cells to humans need to adapt continuously to respond to changes in their environment. The process of behavioural adaptation can be thought of as improving decision-making performance according to some utility function. Here, we consider an abstract model of organisms as decision-makers with limited information-processing resources that trade off between maximization of utility and computational costs measured by a relative entropy, in a similar fashion to thermodynamic systems undergoing isothermal transformations. Such systems minimize the free energy to reach equilibrium states that balance internal energy and entropic cost. When there is a fast change in the environment, these systems evolve in a non-equilibrium fashion because they are unable to follow the path of equilibrium distributions. Here, we apply concepts from non-equilibrium thermodynamics to characterize decision-makers that adapt to changing environments under the assumption that the temporal evolution of the utility function is externally driven and does not depend on the decision-maker’s action. This allows one to quantify performance loss due to imperfect adaptation in a general manner and, additionally, to find relations for decision-making similar to Crooks’ fluctuation theorem and Jarzynski’s equality. 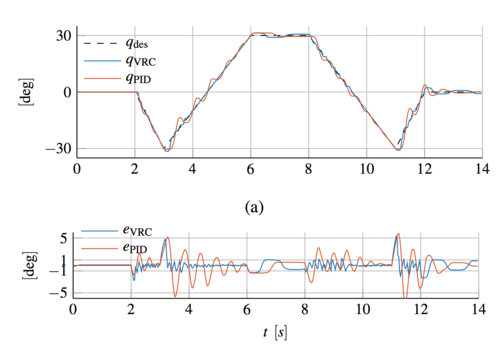 We provide simulations of several exemplary decision and inference problems in the discrete and continuous domains to illustrate the new relations. Lioutikov, R., Neumann, G., Maeda, G., Peters, J.
Osa, T., Ghalamzan E., A. M., Stolkin, R., Lioutikov, R., Peters, J., Neumann, G.
Padois, V., Ivaldi, S., Babic, J., Mistry, M., Peters, J., Nori, F.